By Alfred Rosenberg. Selected and translated with an introduction by Alexander Jacob. The National Socialist movement has hitherto been dismissed as an ad-hoc racialist movement that had no serious political philosophical foundation. 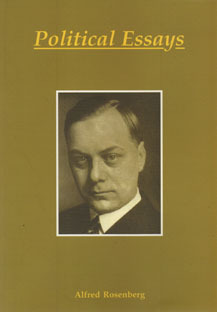 But one has only to read the several writings of the chief ideologue of the movement, Alfred Rosenberg (1893-1946), to discover not only a clear philosophical account, especially in his principal work, Der Mythus des zwangisten Jahrhunderts, (Munchen, 1930) of what the regenerative movement of National Socialism sought to achieve in the Third Reich through its doctrine of racial worth and power, but also (in Rosenberg’s numerous essays) the ideological bases of the foreign political aims of the Reich during the Second World War. When the NSDAP acquired full political power in 1933, Rosenberg was given nominal control of the Party’s Foreign Policy Office. In 1934, he was appointed leader of ideological indoctrination and education. Only during the war, in 1941, did Rosenberg obtain a major political post as Minister for the Eastern Occupied Territories. At the end of the war, Rosenberg was arrested and tried at Nuremberg, where he was condemned to death by hanging on 15 October, 1946. P/B 152 pp.